Try our special jams with your favourite cheese, your dinners will be a success! From € 3,50, lots of goodies to savour with your friends! Our jams are prepared from selected ingredients, directly harvested at the Poggio delle Ginestre farm, and masterly combined to create unique delicacies. 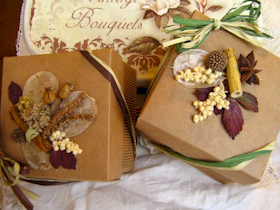 All our bonbonnières and other packages are hand-decorated with natural materials that the woods surrounding the farm have to offer. The farm is located inthe beautiful Umbrian countryside near the Lake of Bolsena, in high Latium, and the nearby Tuscan Maremma, in a natural frame that enhances its culinary excellence. 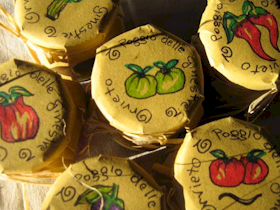 The idea of combining cheese & jam springs from the research for traditional flavours that Gildo and Cristina have undertaken travelling the roads of Umbria, where they live in their farm, Poggio delle Ginestre, located in a particular area near the border between Tuscany and high Latium. The many dairy factories present in their area and the genuineness of their cheeses, stimulated their experiments in combining cheese with the products of their garden. The farm's production concentrates mainly on special jams and preserves, deriving from a careful selection of ingredients to be combined with the traditional flavours of Italian cuisine. The union of unusual flavours has resulted in unexpectedly tasty and successful combinations. Also "classic" jams and marmalades are produced in Poggio delle Ginestre farm, enhancing the flavours and the sweetness of our ripe seasonal fruit, cropped and transformed immediately. In our experience these special jams and preserves are the key to a successful dinner, in which good taste and distinction mingle in a surprising manner, capturing even the most demanding gourmets. Poggio delle Ginestre also offers seasonal products, such as chestnuts, organic wildflower honey, dried fruit and aromatic salt, and manufactures wedding gifts and bonbonnières, christmas baskets and other quality gift sets. Poggio delle Ginestre farm is located in the countryside around Orvieto, in a wonderful natural triangle. Although belonging to green Umbria, it is just a few miles away from the lake of Bolsena, in northern Latium, and very near to the Tuscan border. Typical are its surroundings, that, apart from Orvieto, world-famous town of great historical and cultural interest, also include evocative Civita di Bagnoregio, or Viterbo with its spas - the Terme dei Papi - or even San Casciano Bagni in Tuscany, another thermal station. Orvieto can be defined as "tell-tale city", where many historical ages meet, from the Etruscan age to present days. Spending a holiday in Umbria is one of the most relaxing and pleasing way to spend your free time. 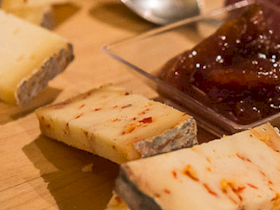 Try combining our jams and preserves with your favourite cheese, you'll love them! The freshness of the ingredients and the extreme care in the preparation make our jams unique. 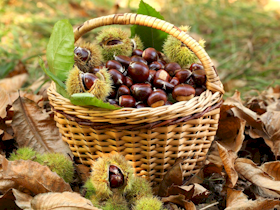 In Poggio delle Ginestre farm we produce honey, chestnuts and other specialities of the Umbrian countryside. Impress your friends with the unique baskets and wedding gifts of Poggio delle Ginestre.